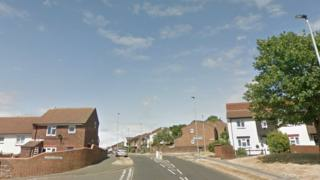 A corrosive substance was thrown in a man's face during a street robbery in Brighton. The victim, 19, "staggered" to a house in Exceat Close at about 20:00 GMT on Sunday and said his "eyes and throat were burning", Sussex Police said. He told officers he was approached and attacked by a man who demanded he hand over his wallet and mobile phone. He is being treated in hospital for injuries to his eyes, face and tongue. Det Con James Botting said: "We are appealing for any witnesses who saw this attack or anyone acting suspiciously in Whitehawk Road at the time to come forward." A 20-year-old man, who was arrested on suspicion of robbery, has been released with no further action.